Let's start things off by going through some IDP news, notes, and commentary from Week 13 of the NFL season. Browns defensive tackle Larry Ogunjobi left Sunday's game with a biceps injury and did not return. Although he's quite questionable to play this week, he hasn't yet been ruled out for Week 14. Vontaze Burfict suffered yet another concussion in last week's game and will have to go through the proper concussion protocols prior to returning to game action. Given his history with brain injuries, he will be highly questionable to play in Week 14. Landon Collins has already been ruled out this week with a shoulder injury and reports indicate he's considering season-ending surgery despite his X-rays coming back negative. Those with Collins on their roster should be seeking alternative rest of season options. Justin Evans aggravated his toe injury early in Sunday's contest against the Panthers and was quickly ruled out. This said, I would expect him to be inactive this coming week. Nick Vigil returned to starting lineup after missing the previous five games with a knee injury. He only had two assisted tackles in the game which isn't great. But he did play 97% of the snaps which signals to me he should be back on our radars as a LB2-LB2+ moving forward, especially if Vontaze Burfict misses time. 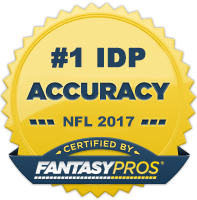 Now onto The Guru's IDP waiver wire selections for Week 14! DE Jonathan Allen (WAS) - Allen has emerged as a consistent all-around threat in his sophomore season and is a big reason why the Washington defensive front has established itself as a formidable force in the NFC East. He has 43 total tackles on the season to go along with five sacks. More importantly, he faces off against a Giants offensive line that has given up 41 sacks (third most in the league). I like Allen's chances of notching a sack this week in a must-win game for his team. DT Denico Autry (IND) - Autry isn't on the radar of a ton of people right now, but that's more so because he's missed four games this year due to a couple different stints with injury issues. He's back to full health now and is coming off a career game in which he had three sacks (bringing his total up to six in seven games). Additionally, he squares off against the Texans this week who give up the third most sacks to opposing defenses. He's a viable streaming option this week, especially in DT-required leagues. DE B.J. Hill (NYG) - The trade of Damon Harrison to Detroit, opened the door for Hill (a third round pick this year) to assume a larger, more prominent role on the defensive line. And the rookie has made the most of that opportunity, averaging over three solo tackles a game since the trade and he is coming off a three-sack performance last week. Although he's not likely to become a significant contributor in the sack columns, he has shown enough already from a tackle perspective to warrant rostering in relatively deep, dynasty leagues that are more tackle-heavy. MLB Eric Kendricks (MIN) - Up until fairly recently, many would consider Kendricks a fantasy underachiever as he failed to reach a double-digit tackle production in any of the team's first nine weeks. He's had two separate double-digit tackle performances over the last three weeks though and has racked up a ridiculous 35 total tackles during that span. He has a top six matchup this week against the Seahawks and is available in quite a few leagues due to his slow start. At this point, consider him an LB3 with upside. MLB Hardy Nickerson Jr. (CIN) - Nickerson came into the game last week to replace the injured Vontaze Burfict and played every down. He put up four tackles on just 34% of the snaps (which translates to around 12 total tackles if he had played the full game). He had 11 total tackles in the other game he filled in for Burfict back in Week 11, so I think the tackle rate is legit. All this said, if Burfict were to miss time, Nickerson becomes a solid LB3+ option in standard, balanced scoring leagues. ILB L.J. Fort (PIT) - Although he didn't start the game, Fort logged a season-high 52 snaps (83%) and wound up compiling an impressive 12 total tackles (9 solos) as typical starter Jon Bostic stood on the sidelines. The Steelers have been quite erratic in their week-to-week playing time given to linebackers, so there's a chance Fort could go back to a part-time role. However, the Steelers currently have no every-down inside linebackers, so if Fort does see similar snap count rates this week, he could very well be in line for another double-digit tackle performance. He may be worth the risk for owners in deeper leagues that are significant playoff underdogs in need of potential big points. S Jordan Whitehead (TB) - Whitehead had two very nice weeks while filling in for the injured Justin Evans. This said, the return of Evans to the starting lineup last week was supposed to put an end to Whitehead's fantasy relevance. However, Evans had to leave the game early as he re-injured his toe and Whitehead played the rest of the game, racking up 7 total tackles in the process. Given how quickly Evans was ruled out, he's likely going to sit this week which makes Whitehead a viable DB2- option for fantasy owners in Week 14. S Eli Apple (NO) - Apple has been getting picked on relentlessly since coming over to the Saints in a mid-season trade. Given he plays opposite an arguably elite corner in Marshon Lattimore, expect the throws/opportunities to keep coming his way. He's sneakily been a top 10 fantasy cornerback in a lot of leagues since the trade went through heading into Week 8. He squares off against the Buccaneers this week who allow the third most points to opposing corners, so consider him a top 35-40 DB play for this Sunday. CB B.W. Webb (NYG) - Webb has racked up five or more solo tackles in three of his last four contests to go along with an interception, forced fumble, and three pass deflections. He gets the pleasure of going against Mark Sanchez this week, which dramatically improves his chances of an interception. Consider him a high floor CB2 option with some big play upside in Week 14. If you have any questions, feel free to email me at theidpguru@idpguru.com or follow me on Twitter.